Samsung’s next flagship smartphone, the Galaxy S10 series, is rumoured to have a hole-punch camera display. The idea that smartphones have peaked gathered steam last year among tech pundits. Global smartphone sales dipped in the last quarter of 2017, though the market returned to growth (1.8 per cent) in the first quarter of last year. The most recent report for the third quarter of last year was similarly anaemic - sales were up just 1.4 per cent from the same quarter in 2017. Sales are plateauing as consumers, especially those in developed markets, are not upgrading as frequently as before. But the market slowdown appears to be forcing manufacturers to innovate out of the slump. Take the foldable smartphone, which may actually become a thing this year. Chinese firm Royole Corporation was the first to announce such a device last year, but all eyes will be on market leader Samsung after it unveiled its own foldable prototype last November. Besides the rumoured cost of this Samsung foldable phone (a hefty US$1,800 or S$2,460), there are questions about its usefulness. "A foldable phone can indeed benefit business users and processes by arming mobile employees with a pocket device that can be converted into a larger screen for productivity purposes, in theory, at least," says Mr Bryan Ma, vice-president of client devices at market research firm IDC. But he feels that it "will take time for developers to write applications that dynamically adjust and take advantage of the larger screen". Meanwhile, manufacturers continue to reduce the borders around smartphone displays. The latest design innovation towards this goal is the hole-punch camera display, where a hole is made near the corner of the screen to accommodate the front camera. "This technology is complex as it involves cutting through the layers of the display and adding the camera sensor below it. It may cause light dissipation around the edges," says Mr Parv Sharma, an analyst at Counterpoint Research. He adds that the hole-punch display will co-exist with the notch one and make headway in the mid-range segment. Huawei and its Honor sub-brand, as well as Samsung, have already showed off smartphones with this feature last year. Notably, Samsung's next flagship smartphone, the Galaxy S10 series, is heavily rumoured to sport a similar hole-punch camera display. 5G - fifth-generation cellular mobile networks - is also on the cards. These networks, which promise peak speeds of up to 10Gbps and low latency, are being rolled out this year in markets such as the United States. Qualcomm's latest Snapdragon 855 chipset supports a modem for 5G networks. Mr Will Wong, IDC's research manager, says the first 5G smartphones will be introduced this year, though most countries, including Singapore, do not have their 5G networks ready yet. "The emergence of Chinese smartphone vendors has accelerated the market competition and stimulated the need to be the first mover in the market," he says. Mr Sharma expects more than 15 manufacturers to introduce 5G smartphones this year. He estimates these phones to start at around US$800. Apple iPhone users, though, may have to wait until 2020 for a 5G-enabled iPhone. Qualcomm and Apple have locked horns in a patent lawsuit. The latter has switched to an Intel modem for its recent iPhones. 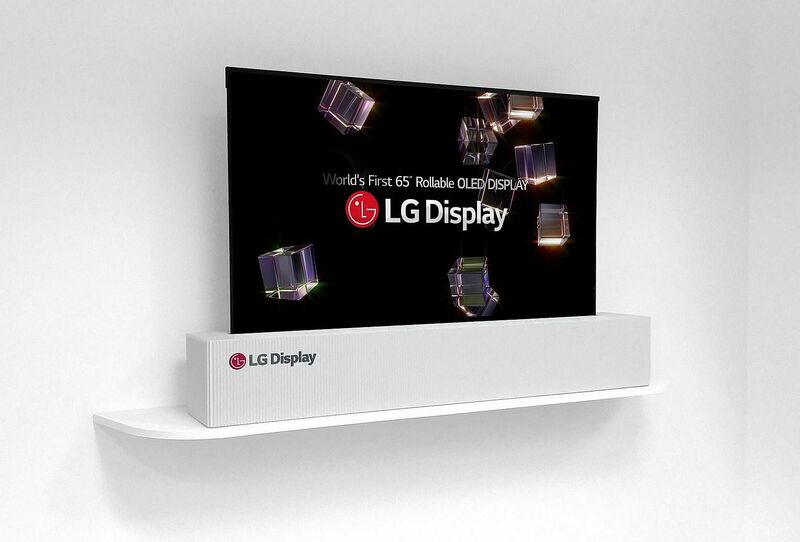 Television sets with roll-up displays are on the cards for TV-maker LG. The South Korean electronics giant first revealed a prototype TV with a retractable Oled screen (right) at last year's CES trade show. According to Bloomberg, this "rollable" TV will be released commercially this year. Designing a rollable TV is a way to minimise the visual impact of TVs, which increasingly sport bigger screens, says Mr Paul Gagnon, executive director at market research firm IHS Markit. "The idea of a rollable display that can be removed from the living environment is attractive and also makes transportation of a very large display easier." Another example of this trend: Manufacturers such as Samsung and LG are making their TVs look like picture frames that can blend in with the surroundings or display art. This ensures that the "TV doesn't become a giant black hole on the wall when not in use", says Mr Gagnon. Also likely to make its entrance this year is Samsung's microLED television. Like Oled technology, the individual pixels in a microLED display emit light, which leads to better contrast and deeper blacks than LCD technology. The difference is that microLED displays use inorganic material (gallium nitride), which is capable of higher brightness levels than the organic material in Oled screens. Mr Gagnon expects the market to grow slightly, with about 223 million units shipped. Almost 99 per cent of these TVs will use LCD technology while the rest will use Oled screens. Oled TVs, despite their relatively high prices, are popular with affluent consumers - shipments are expected to grow from 2.5 million units last yearto 3.4 million units worldwide this year. The camera industry has been considered a sunset one for a long time. But it perked up last year with the launch of new full-frame mirrorless camera systems from imaging giants Canon and Nikon, the EOS R and Z6/Z7 respectively. Further stoking excitement was theL-Mount Alliance by Leica, Panasonic and Sigma, announced at last year's Photokina, the world's biggest camera trade show. The alliance allows Panasonic and Sigma to create cameras and lenses for the Leica L-mount system. As such, there is much excitement and anticipation for this year. One thing is for sure - photography buffs will definitely see the launch of the Panasonic S1 and S1R full-frame mirrorless L-mount cameras. I had a brief hands-on session with a non-functioning prototype in Photokina and loved its feel and handling. However, Olympus seems to be happy with the Micro Four Thirds format, while Fujifilm has not signalled any intention to go full-frame as it has a medium-format mirrorlesss camera system. Olympus will probably launch its next flagship OM-D E-M1 Mark II successor this year. Rumours are that it will be called E-M1X and might be released as early as next month. Fujifilm's 2017 X-T20, itsmid-range APS-C mirrorless camera, is in need of a refresh and rumours are pointing to a first-quarter launch. With 2020 an Olympic year and Tokyo being the host, Canon and Nikon will probably hold off the launch of their flagship DSLR cameras untilnext year. As such, these two imaging giants are probably going to concentrate on expanding the lens line-up for their full-frame mirrorless cameras. But, hopefully, they can spring a surprise by launching a lower-end full-frame mirrorless model this year. At the same time, there are hopes the camera industry will start to embrace computational photography, or image-capture using digital computation techniques. Google Pixel 3's amazing Night Sight function has shown how photography can benefit when computational photography is done right. This might be the key to making cameras great again. The wearable market will continue to grow as the differentiation between smartwatches and basic fitness trackers gets more blurred. Smartwatches usually have more features such as built-in GPS, bigger touchscreens and faster performance, but they are more expensive. Fitness trackers are cheaper, but provide only basic fitness monitoring functions. However, both categories have been upping the ante. More smartwatches are having advanced health features, for example the Apple Watch Series 4 with its ECG measurement feature, while more fitness trackers are having touchscreen displays and able to show notifications. Mr Jitesh Ubrani, IDC's senior research analyst, says: "Many new basic wearables have features like notifications or simple app integrations that bleed into smartwatch territory. As more features get added and the price difference between basic trackers and smartwatches narrows, brands could potentially move consumers upstream to smartwatches." According to IDC, the Apple Watch will continue to dominate the smartwatch category over the next few years. Apple led the market last year with a 47 per cent forecasted share. While this is expected to decline to 36.2 per cent by 2022, it will continue to be the market leader. For now, the smartwatch market is bolstered by the relatively stable and higher average selling price of the Apple Watch, says Mr Alan Antin, senior director at research firm Gartner. But the overall average selling price of smartwatches is expected to decline due to lower-priced competitors and higher volumes. The worldwide shipments of wearable devices will reach 225 million this year, an increase of 25.8 per cent from last year, says Gartner. Technology brands such as Apple, Fitbit and Samsung have a comfortable lead in the smartwatch market, but traditional watch brands will catch up. Mr Antin says: "Traditional watch brands such as Fossil and Casio will gain market share by offering more style and choice in their portfolio than the technology brands." Montblanc unveiled the superb Summit 2 smartwatch last year, while Casio's Wear OS smartwatch WSD-F30 will launch this month. Fans can look forward to more such smartwatches from traditional and luxury watch brands this year. Computers, unlike smartphones, have long reached maturity, with changes to PC designs and features often being incremental. But PC vendors continue to experiment with new form factors. Notable recent examples include HP's leather-bound Spectre Folio convertible and Lenovo's dual-screen Yoga Book. In fact, Ms Mikako Kitagawa, senior principal analyst at market research firm Gartner, says more vendors may take a page from the Yoga Book, which comes with two displays - an E Ink screen and a standard touchscreen - and come up with their own versions. Change is also brewing in computers. Over a year ago, Qualcomm revealed its plans to compete with Intel in the PC segment with a Windows 10 laptop powered by a Qualcomm chip. The firm stepped up its efforts last month with the Snapdragon 8cx platform, which promises constant connectivity, including 5G support, as well as long battery life. Qualcomm says these devices will be launched in the third quarter of this year. In the first half of last year, the PC market appeared to be in its best shape in years. Global PC shipments managed a slight uptick (2.7 per cent) in the second quarter of 2018 - the first time in six years - according to Gartner. But the market stayed flat in the third quarter and it is unlikely the fourth quarter of last year will show an improvement because of the ongoing shortage of Intel processors, which power most computers. Intel's main rival AMD has been re-energised in recent years and has a good product in its Ryzen processor. But PC vendors, especially notebook vendors, cannot easily switch chip suppliers at short notice to alleviate Intel's processor shortfall. Ms Kitagawa expects the processor shortage to ease later this year. She does not believe the current shortage will have a lasting impact on demand, as this is being driven by businesses upgrading to Windows 10. Overall, she expects worldwide PC shipments to increase slightly this year compared with last year.